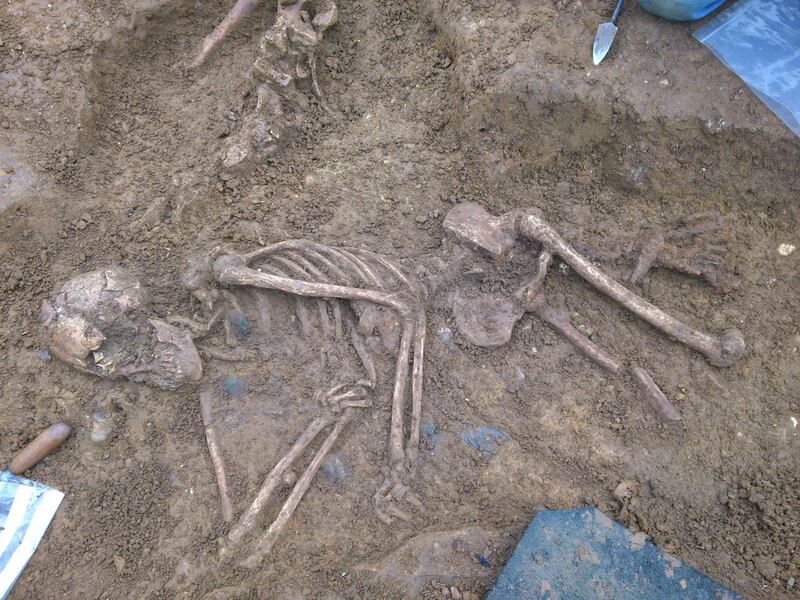 An Anglo-Saxon woman was found buried with a cow in a late 5th century cemetery in Oakington, outside of Cambridge. 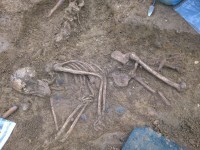 Anglo-Saxon warriors have been known to be buried with their horses, but this is the first time a woman has been found buried with a domestic animal. In fact, when the animal bones were first excavated, archaeologists assumed it was a horse because they’d already unearthed two other graves in the cemetery of men buried with their horses. 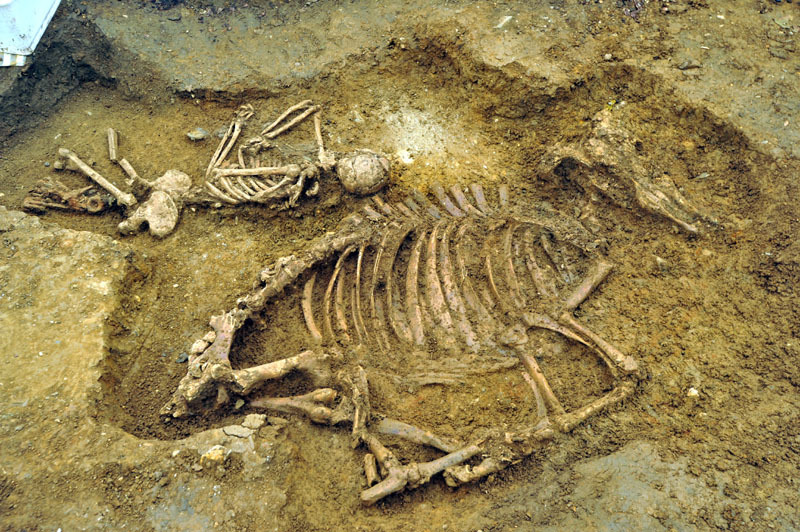 They were excited to find a horse buried with a woman because all 31 of the horse burials discovered in Britain are of men. When they realized the animal bones belonged to a cow, their excitement hit the roof. It’s the first cow burial ever found in Europe. Cows were of enormous value to a community. They were a precious source of meat and dairy which cost a great deal to feed and keep healthy. One cow could make the difference between a community surviving or dying of starvation. Burying the cow would have been an enormous loss for the community to suffer. The woman buried with the cow, therefore, must have been an extremely important person to warrant such a valuable gravemate, especially this early in Anglo-Saxon society. Her high status is confirmed by the rich adornments found on her body. Grave goods include copper alloy brooches, three necklaces and hundreds of amber and glass beads. “She also had a complete chatelaine [keychain] set, which is an iron girdle and a symbol of her high status,” [University of Central Lancashire’s Dr. Duncan] Sayer said. “It indicates she had access to the community’s wealth. A team of archaeologists from Manchester Metropolitan University, the University of Central Lancashire, Oxford Archaeology East and some undergraduate history students from MMU are excavating the Oakington site. It was one of the MMU students — Kate Smith, 19 — who first discovered the woman’s grave. The team has thus far discovered 100 graves, and they estimate there are another 50-60 graves in the cemetery. The dig will continue for another three weeks, but even if they stopped today it would still be one of the most important Anglo-Saxon sites in the country. For more about the excavation and to keep abreast of anything else they discover, see the Oakington dig Facebook page or follow them on Twitter @oakingtondig.